Most discussions of South Asian maritime security are dominated by the balance of power between the Indian Navy and its Chinese counterpart, the People’s Liberation Army Navy (PLAN). On the one hand, India makes waves with its ongoing work on the Vikrant-class aircraft carrier, the introduction of the Arihant-class nuclear-powered ballistic missile submarine, and other efforts toward fleet expansion and modernization. On the other hand, PLAN vessels patrol the Indian Ocean region, which India regards as part of its sphere of influence, ostensibly to ‘combat piracy’. Prior to the 2012 establishment of INS Baaz – an Indian naval airbase in the Andaman and Nicobar Islands, viewed by both the Chinese and the Indians as a chokepoint in the Strait of Malacca, the focus in South Asia was on the seemingly interminable Indo-Pakistani rivalry. But the maritime capabilities of the People’s Republic of Bangladesh, a country that occupies a geopolitically interesting location between South Asia and Southeast Asia, merits some attention. Facing the Bay of Bengal that separates India from Burma and encompassing the Ganges-Brahmaputra delta, Bangladesh certainly has need for a robust maritime force. As an emerging economy listed by Goldman Sachs among the Next Eleven (the list also includes Egypt, Indonesia, Iran, South Korea, Mexico, Nigeria, Pakistan, the Philippines, Turkey, and Vietnam), Bangladesh has the potential for considerable growth if Bangladeshi authorities begin investing wisely. With several procurement projects for the Bangladesh Navy close to maturity, they certainly seem to be moving in the right direction. submerged displacement of approximately 2,110 tonnes. These will be employed principally as training vessels; Bangladesh has not previously boasted a submarine fleet of its own. The apparent intent is to subsequently acquire more advanced diesel-electric submarines from either Russia or South Korea. A likely contender, given the capabilities and size of the Ming III-class, is the Chang Bogo-class submarine, which South Korea-based Daewoo Industries is exporting for use by the Indonesian Navy. Bangladesh is also expected to take delivery of two Jiangdao-class corvettes, each with a displacement of approximately 1,500 tonnes, from China by the end of 2015. An order has already been placed for an additional two vessels of this class. This makes Bangladesh only the second foreign buyer, after the Nigerian Navy, to acquire the Jiangdao-class. The delivery of these vessels will do much to modernize Bangladeshi capabilities at sea, as most of the other surface combatants currently operated are aging. BNS Bangabandhu, the Bangladesh Navy flagship, is currently the nation’s most modern vessel, having begun operational life as an Ulsan-class guided missile frigate built by South Korea’s Daewoo Industries in 2001. Others include two Jianghui III-class frigates and one Jianghui II-class frigate built by China in the 1980s, a retired Salisbury-class frigate built for the Royal Navy in the 1976 and sold to Bangladesh after its original retirement, and two retired Hamilton-class cutters from the 1970s that were subsequently donated to Bangladesh by the United States Coast Guard under the Excess Defense Articles program. A third Hamilton-class cutter may be donated to Bangladesh for conversion into a frigate in 2016. Evidently, Bangladesh has been highly dependent on transfers of decommissioned military equipment but has recently become ambitious about acquiring off-the-shelf technology from China, South Korea, and to a lesser extent Russia. Of note, however, is the opportunity for the South Asian country to develop its own shipbuilding industry under the ‘Forces Goal 2030’ program. This initiative, introduced by the Bangladesh Armed Forces in 2012, envisions the country’s emergence as a regional power with dominance over the Bay of Bengal, but also includes more attainable goals like the development of a ‘blue economy’ by tapping into natural gas fields off the Bangladeshi coastline as well as the aforementioned development of the Bangladesh Navy’s Khulna Shipyard, not only to satisfy domestic demand but also potentially as an exporter of finished vessels. 2013. Based on the design of China’s Jiangdao-class corvettes, these LPC were homebuilt and are expected to be the first of a total complement of eight such vessels. The Maldives has already expressed interest in acquiring patrol craft from Khulna for its Coast Guard. The prospect of supplying foreign buyers represents a significant shift for both Bangladeshi military and industry; previously, the closest approximation to ‘shipbuilding’ was BNS Shah Jalal, a Thai fishing trawler seized in Bangladeshi waters in 1987 and put into service as a patrol craft before being converted into a diving salvage vessel in 1996, in which role it continues to serve as of this writing. As it undergoes such rapid change, there is some question as to how organizational culture will cope. Bangladesh is notably avoiding the pitfalls of rushing into the purchase of new submarines, ensuring it first has adequately trained personnel to operate such vessels. 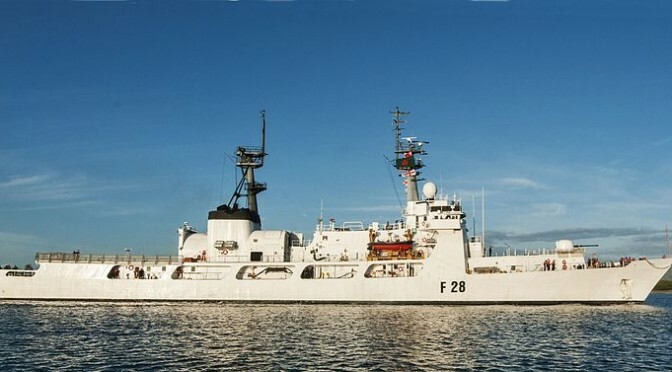 But it is also worth noting that Forces Goal 2030 does not include any procurement projects for the Bangladesh Coast Guard, whose newest vessels are re-commissioned Minerva-class corvettes from Italy. 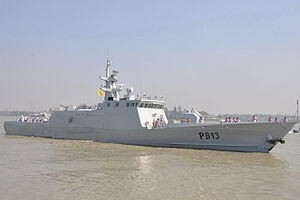 One can surmise from this that Bangladesh intends to employ its Coast Guard for riverine patrols, but that most of that responsibilities fulfilled by this branch offshore will gradually transfer to the Bangladesh Navy. Without a shift in organizational culture and necessary changes to naval training to account for this expanded role, the Bangladesh Navy could inadvertently contribute to increased tensions with other countries that share the Bay of Bengal, namely India and Burma. Claims of ‘dominion’ over those waters, coupled with a few heavy-handed confrontations, could be sufficient to jeopardize relations between Bangladesh and India at a time when the latter loans the former an average of almost $1 billion a year for infrastructure projects. No matter the route Bangladesh takes with regard to the division of labour between its maritime forces, it is clear that this country does not receive sufficient attention in analyses of South Asian security. An emergent Bangladesh is unlikely to challenge India for supremacy in the Bay of Bengal, but it could tip the balance of power one way or the other in the struggle between China and India. Accordingly, other powers with a stake in Asia should keep an eye on Bangladesh’s fleet expansion and modernization. Paul Pryce is the Senior Research Fellow for the Atlantic Council of Canada’s Maritime Nation Program and serves as Political Advisor to the Consul General of Japan in Calgary. He is a long-time member of the Center for International Maritime Security (CIMSEC). It the Coast Guard is to get the Minerva class frigates, then the Bangladeshi Coast Guard will most certainly have an offshore presence. There is a good possibility these ships will be in service for another 15 years. Corvettes I should say, but they are 285 foot, 1300 ton ships. Not bad for a Coast Guard vessel.